Pre-Contest Bodybuilding Journal - 8 Weeks Out! Justin is currently 8 weeks out from the New England Bodybuilding Competition, and everything is right on track. So far Justin is right where he needs to be at the 8 weeks out mark, and will only continue to improve as he progresses in his prep. From 10 weeks out to 8 weeks out not much has changed regarding his training and diet, the most dramatic changes will be at the 6 weeks out mark when we introduce a carbohydrate cycling protocol to really strip his body fat down and get into the shredded condition that he will need to place in the money come May 8th. At this point in Justin&apos;s contest prep he is using his weekly progress as momentum to keep him training and dieting harder as the weeks close in on his show date. Weekly progress momentum is a very good way to keep yourself motivated to continue to improve. Each week Justin is working on beating his previous week&apos;s attention to diet and training, and this is what needs to be done to make the necessary improvements in order for Justin to make an impact at the New England&apos;s. With Justin&apos;s team of supporters helping him each step of the way the only thing Justin will do is continue to make dramatic improvements on a weekly basis. Body Fat: As you can see in the recent 8 weeks out photos, Justin has improved dramatically in his condition. As I stated in the first journal entry we do not do weekly body fat measurements to track progress. Instead we take many weekly photo&apos;s to asses the specific areas that need to improve on, and also look at the overall improvements with his condition to see the changes Justin must make in his diet, training, and cardio for the upcoming week. From 10 weeks out to 8 weeks out Justin&apos;s diet remained the same due to the fact that he was making dramatic improvements in his weekly photo assessments. Justin also dropped 12lbs-14lbs in bodyweight from the 10 week mark to the 8 week mark, which clearly showed us that he did not need to adjust anything regarding his diet, training, and cardio. He also employed a cheat meal at this time which consisted of 3 slices of pizza and an ice cream sandwich after a brutal leg workout. After this cheat meal you could see noticeable improvements in the fullness of his physique, and if anything helped his fat loss for the upcoming week. As far as his cardiovascular work goes, from 10 weeks out to 8 weeks out he performed one 20min session of cardio each week, which was more than enough for his body. Both of these sessions were performed on the Precor elliptical machine. This upcoming week his cardio will be increased to two 20min sessions a week depending on his rate of fat loss. You can refer to the diet section in the 10 weeks out journal to see how this breaks down over the course of Justin&apos;s 6 daily meals. This is only the macronutrient breakdown for this day. In the 6 weeks out journal his daily meal schedule will be listed. * The supplement intake will increase as the show approaches. 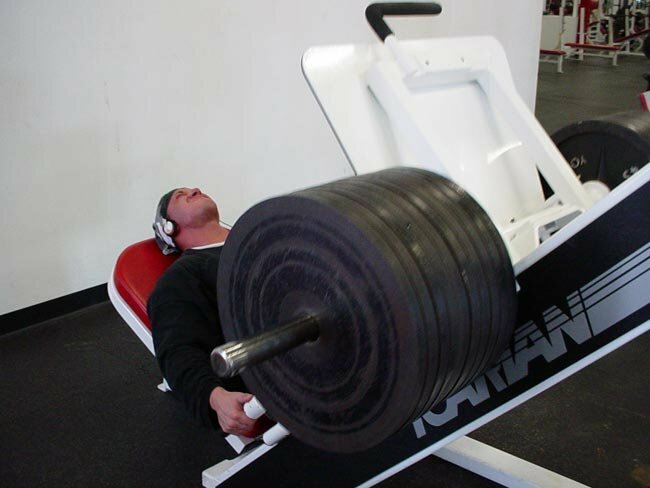 If there are dashes between the reps or the weight that means that a drop set was performed on that set. During this workout Justin went lighter than usual on Barbell Squats due to his energy levels. 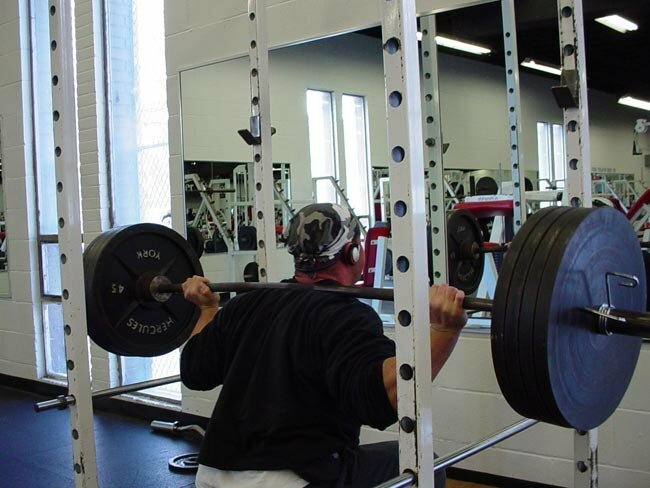 At this point in his prep it is not nessicary to use 585lbs for doubles and triples on squats. With 495 lbs. 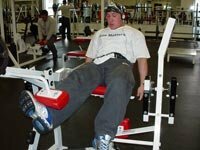 he is still using more than enough weight to effectively stimulate his quads. 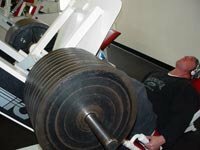 We do not want to risk an injury at this point in his prep to use ridiculous poundage, so we will stay on the safe side. - Today&apos;s workout consisted of chest. Justin has been keeping his carbohydrate intake slightly lower than the last two weeks, and only going high on leg day and back day. So for today his intake looked like this. You can refer to the diet section in the 10 weeks out journal to see how this breaks down over the course of Justin&apos;s 6 daily meals. This is just the macronutrient breakdown for this day. Today&apos;s training consisted of Back and calves. For today his carbohydrate intake was pretty high at 400g, with a moderate protein intake, and a low fat intake. His diet for today looked similar to his diet on Sunday when we trained legs. * The first three sets of barbell rows were performed "Yates style" and the last set with 225lbs was performed the "Haney style." 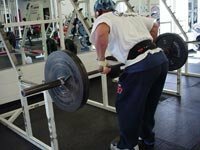 If you do not know the difference between the two, Yates performed his rows more upright, while Haney would stay more bent over and get a long stretch like a stiff leg dead lift. You can see this in the back training pictures. 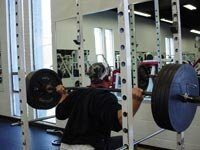 - This workout was specifically designed to prioritize Justin&apos;s lower lats where he needs the most work. Most of these exercises were picked to target that specific area. Because Justin has high lats and a wide shoulder girdle his lats appear as if they fade as they go down to his lower back where they tie in, we have been focusing on bringing this area up the last few weeks, along with his traps from his back shots. - Today&apos;s training was traps and shoulders. Justin&apos;s carbohydrate intake was more moderate today, similar to Monday&apos;s diet. * This tri-set consisted of front d-bell raises with 30lbs, followed by Arnold overhead d-bell presses with 60lbs, and ending with rear lateral raises with 40lbs. After three sets of this our shoulders were toasted and that concluded the workout. This was a productive workout but due to the fact that legs, chest, and back were performed the days before this without a day off it was some what hard to generate a high amount of intensity for this shoulder workout. Justin was physically drained during the workout, but I kept him in good sprits by reminding him that he only had 7 weeks left to show the outstanding improvements that he made from last year regarding his new size, and improved conditioning. This motivated him to continue hammering away at the weights. Today was Justin&apos;s day off, and he sure did need it. After the string of workouts over the last week Justin needed a full day to just rest and recover. Since he did not perform any cardio or weights today his calories were reduced compared to the previous day&apos;s calorie intake. You can refer to the diet section in the 10 weeks out journal to see how this breaks down over the course of Justin&apos;s 6 daily meals. Today was leg day and it was an awesome workout from start to finish. Since we would be going back to college Sunday it was going to be hard to get a leg workout in, so instead we decided to just do it one day earlier. The main factor that made this an awesome workout was that we got to perform parking lot lunges, Ronnie Coleman style. The gym we go to back home has a back parking lot entrance that slopes down to the parking lot, so waiting outside of the gym in the parking lot, we got the crazy idea of doing lunges up and down it (incline and decline). The manager that we know pretty well was all for it (thanks Paul) and helped us bring the barbell out side where we performed 3 sets of barbell lunges with 95lbs up and down the parking lot. 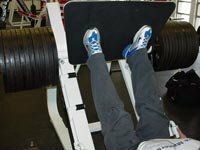 Each of these sets consisted of about 60-70 reps total, and after that our legs were totally destroyed. Now onto the diet. Since today was a leg workout Justin&apos;s carbohydrates were slightly higher. He also ate a small cheat meal at night (oreo cookie ice cream cake...yum) due to the flat and drained appearance that he had yesterday and today in the gym. - Today was an awesome workout to finish off the week because the intensity level of this workout was right where it needed to be. Today was the first time doing parking lot lunges as well which made the workout even better. If anyone reading this gets the chance to try them, do it! 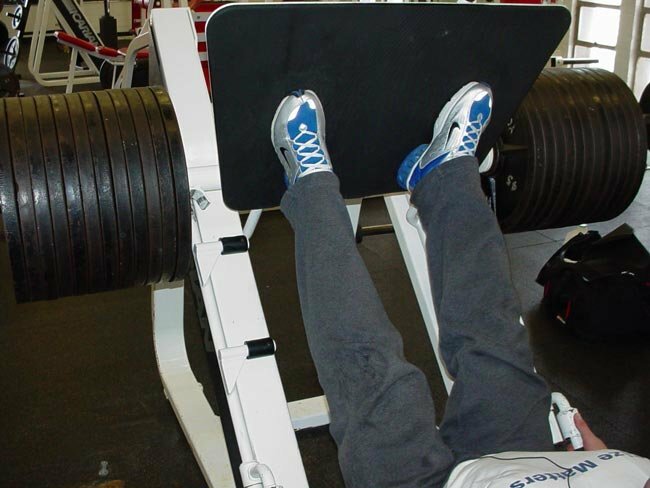 they are an unbelievable leg exercise. Overall I feel this week has went very well for Justin, and he would say the same. The changes that he made over the course of this week were very noticeable, he seems to keep getting harder and more vascular all over. I am very excited to see what is going to happen at the 6 weeks out mark when we revamp his diet to a carbohydrate cycling approach; the results are going to be incredible! The next installment of the journal will be at 6 weeks out when we make big changes to his diet. Until then, if there are any questions or comments about Justin&apos;s preparation please feel free to e-mail me at Kas1n0l3i30y@aol.com.